The 2016 Honda CR-Z sets out to do what only a few vehicles in history have done: blend high efficiency with a high-style, hot-hatchback profile. Like the BMW i8—only not so extravagantly engineered—the CR-Z mashes up its fuel-efficient hybrid powertrain with the profile sporty two-seater. It ends up not terribly convincing in either aspect. It’s not all that entertaining to drive, and its gas mileage is handily outpaced by bigger, more accommodating hybrids. Its sporty credentials lie almost exclusively in this factoid: It remains the sole hybrid offered with a manual gearbox. The original design goal was to add a modern hybrid system into a modern version of the sporty, nippy, fuel-sipping CRX two-seater of two decades ago, much beloved even today. But the requirements of modern safety, plus the hybrid powertrain, added a lot of weight—it’s about 700 pounds heavier than the old CRX. The feeling that resulted just couldn’t compare to the lightweight coupe from another era entirely. The long hood and long doors of the CR-Z lead to a narrowing tail with a vertical second rear window in the hatch, borrowed from the now-defunct Insight hybrid. It’s a good-looking car from most angles, but the sporty looks aren’t adequately supported by its actual driving character. It’s now the only surviving Honda with a two-tier instrument panel, which uses bright colors to convey vehicle operating information as well as the usual speed and engine revs. The seats are well bolstered, although their limited range of adjustment gave several reviewers back aches. And luggage space is limited to a couple of small, soft bags—forget about carrying any rectangular cardboard boxes. The CR-Z is powered by 1.5-liter inline-4 and 15-kw (20-horsepower) electric motor sandwiched between engine and transmission. Output is 130 hp, and the 6-speed manual version has a rated torque of 140 pound-feet. In Sport mode, a boost function known as the “Plus Sport System” lets the driver press a steering-wheel button marked “S+” that delivers an extra jolt of electric torque for up to 5 seconds if the battery’s charge is sufficient. The small lithium-ion battery pack is located under the cargo-bay floor, one of the reasons luggage space is so minimal. The much heavier structure lets the CR-Z comply with modern safety tests the CRX’s designers never even dreamed of, though its ratings are only so-so. It has a full complement of airbags, and a rear-vision camera is standard. For 2016, Honda has added its clever LaneWatch system, which shows an image of the lane to the right of the car on the central dash display when the driver signals a right-hand turn. It has a full complement of airbags for two people; the CRX had none at all. In a car market that increasingly opts for utility vehicles over passenger cars, the CR-Z’s small size and two seats present a major drawback for many—and its very limited cargo capacity undermines its suggestion of hatchback practicality. There are both sportier cars and more fuel-efficient models out there. The CR-Z has suffered from this betwixt-and-between identity since its launch, and sales have been correspondingly low. Many four- and five-seat small cars are now almost as good on gas mileage, including the Honda Fit subcompact—a perennial favorite for its clever Magic Seat and enormous interior flexibility—that is rated at 37 mpg and sits next to the CR-Z on showroom floors. Fuel efficiency is better with the continuously variable transmission (CVT), at a combined 36 mpg city, 39 highway, 37 combined. The CR-Z is also available with a 6-speed manual gearbox—making it the sole hybrid with a stick—which gives a sportier driving character, but cuts mileage to 31/38/34 mpg. For context, three models of the Toyota Prius—larger, more comfortable, and offering four or five seats–get 50 mpg combined. The 2016 Honda CR-Z evokes a blend of the two-seat Insight and CRX models, but its interior seems modeled after a video game. The 2016 Honda CR-Z has gotten a few design tweaks to keep the 6-year-old shape looking modern. They include a reshaped front fascia with a more angular, eight-point grille, and a front air diffuser below. There are also new side sills, and a new alloy-wheel design. At the rear, the fascia has been reshaped, with an interesting boomerang-like trim piece wedged into the back bumper. But the CR-Z’s basic shape remains the same. It’s a distinctive flared-out teardrop with an abruptly truncated rear end. The CR-Z blends influences from a pair of different two-seat cars: the much-loved 1983-1991 CRX two-seat hatchback, and the ultra-efficient 1999-2006 Insight two-seat hybrid coupe. Overall, the car conveys presence on the road, even if we’re not convinced you could call it attractive. The shape is equal parts sporty and efficient, a blend that’s often difficult to get right. In this case, the CR-Z must strike a balance between minimal aerodynamic drag and meeting the demands of modern crash tests. 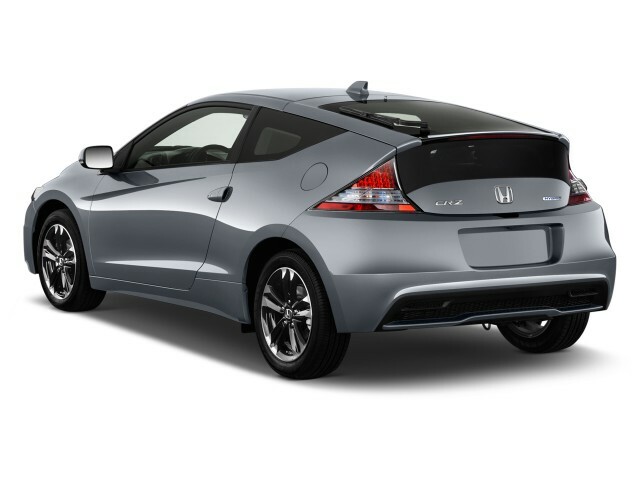 The CR-Z’s tall tail, with a vertical glass panel to improve rear visibility, was a theme of both the CRX and the first Insight. where lower electric steering assist helps it track more cleanly. In all, the Elantra has a more substantial feel now. It doesn’t punish drivers for taking a side road instead of a highway, nor does it ask to be thrashed like a Focus or Mazda 3. Hyundai is aiming for top-drawer safety with the new 2017 Elantra. It’s predicting a Top Safety Pick+ award from the IIHS as well as a five-star overall rating from the NHTSA. Seven airbags are standard and a rearview camera is available. So is a bundle of advanced safety technology that uses cameras and radar to provide forward-collision warnings with automatic braking; adaptive cruise control; lane-departure warnings and lane keep assist; and blind-spot monitors with cross-traffic alerts. But the bundle is only offered on the most expensive Limited model. The 2017 Hyundai Elantra SE carries a base price of just under $18,000. It has standard power windows, locks, and mirrors; cruise control; air conditioning; cloth upholstery; tilt and telescoping steering; 15-inch wheels; a six-way adjustable driver seat; and an AM/FM/XM/CD audio system with six speakers. The automatic transmission is a $1,000 option. On the features list, the new Elantra offers available heated and ventilated front seats; memory seats; a split/fold rear seat; automatic climate control; a handsfree, gesture-enabled trunk release; USB ports and Bluetooth; Android Auto; and a new navigation system. A premium audio system, satellite radio, and smartphone connectivity are also available, along with Hyundai’s Blue Link telematics package that enables features like remote door unlock and remote start by smartphone. All told, the Elantra can cost up to $27,500 when loaded with all available features.